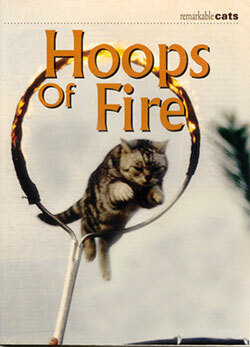 backs of children, sit up on command and, for a stunt not to be missed, jump through a hoop of fire. performance, Dominique uses his charm to make the crowd feel like part of the act and to keep his feline partners enthralled with the performance. He choreographs every segment of the show to highlight the cats' next trick, to get the audi ence's attention or to create a special mood of anticipation. Dominique hails from the Brittany region of France. 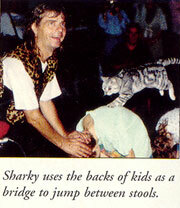 He was performing in Canada as a clown nearly two decades ago when he gave in to his young daughter's pleas for a cat. He quickly added the cat to his one-man clown act and began to establish the unique performing combination that continues to wow audiences in Key West. announces with gusto, "Finale! Finale!" to prime the cats and the audience for this last trick, which is an attempt to get the cats to sit up in unison, something they fail to do from time to time. We can almost read their minds: "We still have to show him who the real bosses are." "The first rule of training is getting the cats comfortable with people," Dominique explains. "They count on me to establish and protect their territory. That's why I make a big deal about moving the people back from the cats. The second thing for the cats, then, is learning the tricks." What are his training secrets? First of all, don't rely on books. "Books mess you up. When it came to training the cats, there was no one able to tell me anything about how to do it. I'm just about totally self-taught. I learned by watching the cats with each other. fact, Dominique seems to have crawled inside the minds of the cats. He knows how they think and why. "They know I'm the top cat. I have to be to earn their respect," he says. I've watched how cats play together, interact with one another, and I use that knowledge every day with my cats. 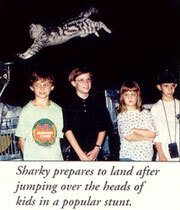 For example, I may make a swipe with my hand at Sharky to get his attention. That's what the mother cat does with her kittens to get their attention," Dominique explains. "Cats respect speed. So I have to be quick with them," he adds. While food can be a valuable reward for these stars, it isn't their sole motivation. "The cats have regular meals during the day, plus treats during the show. But they do the tricks because they want to do them." The tough part is getting the cats to perform on cue. Dominique uses body language, verbal cues and eye contact. For example, at the beginning of each show he enlists the help of a person from the audience to hold a net with rings for Piggy to jump through. While the participant is holding the net at just the right height, Dominique yells, "Don't move and don't breathe!" The volunteer thinks he's speaking to her when, in fact, that's Piggy's cue to jump through the net. Dominique's expressive eyes are a key part of the show. "The mother cat will get the kitten's attention, and then stare at the kitten," he says. "I do the same thing to get Piggy and Sharky's attention. That lets them know to concentrate on the show." "But keep in mind, cats have to be happy to perform," he reminds. "If they're unhappy or scared, they will not perform." Some people think I use devices to make the cats perform, which is ludicrous. If the cats were afraid of me, I couldn't get them to do anything." The affection shared between Dominique and his feline partners is obvious. He rubs faces with them in passing during the show, just as their mother would in the wild. "You don't own the cats, just like you don't own your children," Dominique explains. "Both are easy to train when they're young, and both go through their teenage years, or the cat equivalent, when it's all but impossible to work with them. Both can be as independent as they want to be." and down is something he did on his own, so I added it to the show," he says. Your cats may never be famous felines, but with a little "motherly" influence they'll certainly become the stars of your home stage.